Actually, the Gita’s teaching is that we are not the supreme controllers. But we do have some control, as the Gita itself (15.08) indicates when referring to us souls as controllers (ishvara). We are controllers in the sense that we have enough control to choose our controller. 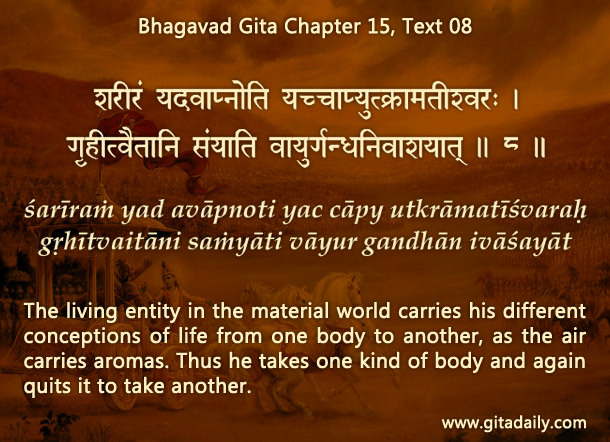 The previous verse (15.07) points to the essential choice before us: Krishna or our senses. To understand, consider our situation in space. We need to be sheltered on the ground or we will be dragged down by gravity. Acknowledging that we can’t control gravity doesn’t mean that we have no control – it simply means that we need to hold on to something firm to avoid falling. Similarly, we as souls are subject to the gravity pull of worldly desires acting on us through our senses. Such desires make us crave for pleasure by controlling external things for sense gratification. But we can’t control external things for long. Acknowledging this doesn’t mean that we are helpless. We can use our finite capacity to control for devotionally holding on to Krishna through remembrance internally and service externally, thereby relishing higher spiritual happiness. By thus holding on to him, we can not only stop our fall towards sensuality, immorality and perversity, but can also become raised by his omnipotent mercy towards spirituality, purity and liberty. By acknowledging that we are not absolute controllers who can dominate and enjoy things as per our sensual desires, we learn to best use whatever control we do have. And by such shrewd use of our controlling capacity, we can gradually become free from the binding control of the senses and become released into Krishna’s liberating arms. Again a very wonderful analogy & deep explanation. Thank you very much prabhu.